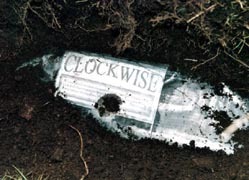 Clockwise was originally written as a puzzle for a one-day hunt by Brian Souter. Brian later expanded the puzzle and it eventually appeared in September 1995 and has been written about (and even rewritten) several times since - most notably by Shaun Whitehead in March 1998, by Brian again in February 2000. The solution revealed to Paul Harkin and Martin Dennett who subsequently rewrote part of the puzzle in April 2001. The prize for solving Clockwise was a clock fashioned out of a signed copy of the illustration from the first club hunt, A Timeless Moral. Although of simple design, the clock is adorned by a pair of exquisite solid gold pointers. They are an exact copy of those created by Dan James in his enchanting illustration and promised to send a tingle down the spine each afternoon and early morning. 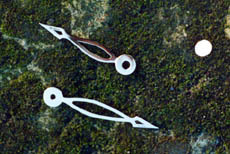 Although the clock was held in a safe place for the person who found the time to solve the puzzle, the gold pointers were buried 30 cm below the ground at the base of a dry stone near Harrogate in Yorkshire. On 2 June 2002 - over six and a half years after being published - the clues in Clockwise finally lead club member Stephen Hallam (right) to search an area of 1.81km2 at Yorkes Folly on the Nidderdale Way just outside Harrogate. Stephen found a treasure map concealed in the iron framework of a public bench - marked with a green spot. With the map and some help from the author's son, Matthew, Stephen dug up a ceramic box containing the gold pointers from a dry stone wall nearby. Members may follow the recent progress of this hunt on the club bulletin board. 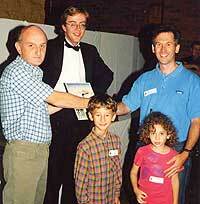 Stephen and his children are pictured receiving their prize from Brian Souter at the 2002 Annual Event, overseen by Martin Dennett. Now I was beginning to get really excited. I now knew that something was hidden in a wall behind a milepost - but where? The last little bit served to be the key. The text read 'Later in the day'. The picture that Brian based the treasure hunt on was the picture of A Timeless Moral painted by Dan and included a time on the clock of 2:32. Could this be another clue? Taking paragraphs and words as before came up with another word that served perfectly as a keyword: BRUSHED, this then allowed me to decode the second set of what I thought at first to be roman numerals. At first, this didn't seem to make sense. I could see roman numerals for 57 (LVII) and also 14 (XIV) but not much else. It was whist discussing it with another hunter that had got this far that the penny really did drop. I said I thought the herring must be in Leicestershire, when the other person asked if there were any nice dry stone walls there. I replied that there were some nice ones in Bradgate Park and also one at Grace Dieu Priory - then it happened - as I said Grace Dieu Priory, I looked down at my notes containing the decoded message. In its centre were the letters GDP, for that brief moment my heart stopped as I realised that I had discovered the location. I clearly remembered the dry stone wall as having a milepost in front of it, as I had been there hunting for gold coins from Treasure with Jeff Crane. A picture of the milepost appeared in the Treasure solution book and it wasn't long before we had the full meaning of the message. The first letter L, was the first letter of Loughborough that appeared on the left of the milepost. This was followed by VII, giving us 7, the number of miles to Loughborough. Then came GDP which were the fist letters of GRACE DIEU PARISH, which was written on the top of the milepost. Next was XIV, 14 in roman numerals, the distance to Burton, which served as the last letter of the message - B. After a frenzied discussion with my dad, we decided to go and have a scout around the following morning. On Tuesday the 5th of October at exactly 9.30 in the morning I eventually located a small thin tube hidden between the rocks in the wall. I could clearly see the word 'Clockwise'; printed on the paper inside. After a few quick photos, it was back to the car to try and open the tube, which was sealed with rubber stoppers in both ends. After many attempts we unfortunately couldn't seem to release the ends and so decided to go back home, a short distance away, and use a corkscrew to free the stoppers. Congratulations on understanding the Black Witch and finding this secret place. Unfortunately, she has led you astray and all you will receive for your efforts is a red herring. To recover your prize from an even more secret place, you will need to understand what the Black Witch had to say when she was seen at exactly 3:23 screeching. 'AKQESKTMHEIMJWKKHSPCALKCJS'. This proved to be another key code cipher, but at this stage I won't reveal where it led, I will let you work that out for yourselves. Once my dad and I had the location where the fish was buried on the map, it was just a small drive there. The clue pointed to an object we are all familiar with, but my dad and I went down the wrong way, and completely missed the object in question. After doubling back I noticed a large high outcrop to my right. Thinking that most of these objects are up high, I began to climb up a large incline. Putting my deep fear of heights aside, I reached the summit, peered over the top and was met by a dog peering back at me. I looked long enough to see the 'marker' where the fish was buried. However, there was a dog and two people sitting on the rocks where I needed to dig, feeling slightly embarrassed and panicky I decided to try another route. We walked around the rocks only to find a nice gentle grassy slope up to where I had tried to climb up to! By this time the people and their dog had decided that we were a few sandwiches short of a picnic and were leaving, peace at last. At fist I could only walk up to the location in for a while before my fear of heights got the better of me. But when it came to the digging, I tossed that fear out of the window to make room for excitement. With the note in the glass tube came a small drawing of a square with N,S,E,W on it, and a line drawn from the E side to an X. The distance was written by the side of the line as 4M. This we deduced as dig 4 meters from the East Side of the marker. Luckily we had brought a tape measure. We measured the distance and stared to dig, couldn't find anything. So we measured again from another side, thinking we had used our compass wrongly, and dug there, still we couldn't find anything. By this time the evening dusk was starting to set in, so we decided to come back the following Saturday and really try harder. During the following week I telephoned Brian to say that we couldn't find the herring and we were going back that Saturday. Brian said to me that he had checked the herring after the event in Bourton, and it was still there. So with renewed vigour we set of once more. So on Saturday 9th October we returned. This time we notice that the marker had N,E,S,W written on it, so out came the tape measure again. After measuring we landed at a spot where we had been digging earlier. I started digging again, and after a while I hit something which when I pulled away enough soil could see was black and dull, not at all like a rock. I looked at my watch and noted the time of 1:15pm. The herring was larger than I had thought and took about 35 minutes to get out of the ground. 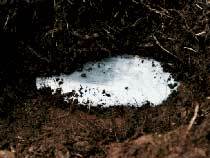 Once we had it, we returned the earth and closed up the hole. I stood next to the marker to pose for some photographs and to admire the view, which was quite something. We then returned home to open the package and inform Brian that we had recovered the rather exquisite herring. I promise to bring him to the millennium event for you all to see.